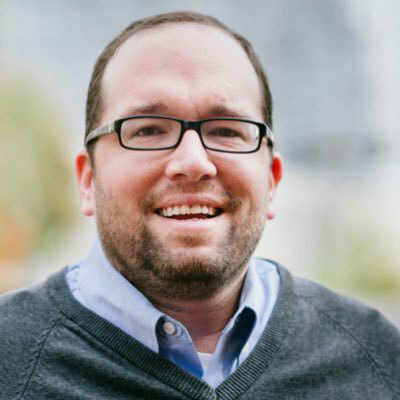 Daniel Darling is the Vice President for Communications for the Ethics and Religious Liberty Commission of the Southern Baptist Convention (ERLC). Dan is the author of several books, including Teen People of the Bible, Crash Course, iFaith, Real, Activist Faith, The Original Jesus, and his latest book, The Dignity Revolution. Sean McDowell: Welcome to the podcast, “Think Biblically: Conversations on Faith and Culture.” I'm your host, Sean McDowell, professor of apologetics at Talbot School of Theology, Biola University. Scott Rae: I'm your co-host, Scott Rae, dean of the faculty and professor of Christian ethics, also here at Talbot School of Theology, Biola University. Sean McDowell: Today we're here with Daniel Darling, the author of a very timely book, called The Dignity Revolution. He is the vice president for communications for the Ethics & Religious Liberty Commission. He writes regularly for publications such as The Washington Post and The Huffington Post and hosts “The Way Home” podcast. Dan, thanks for joining us. Daniel Darling: Hey, it's great to be with you guys. Sean McDowell: I love how you begin your book, because you start with a story about the children's book, Horton Hears a Who, which is a book we've all heard, we've all talked about, but you tell the background story of this book, that I had never heard before. Do you mind? Share with us that background story, and how it lays just the heart or the basis for your book, The Dignity Revolution. Daniel Darling: Yeah, so this story really fascinated me. During World War II, there was a cartoonist named Theodore Geisel, who used his talents to advocate for the Allied cause. Now, he was a supporter of Franklin Roosevelt, Winston Churchill, and the fight against the Fascists in Germany, Italy and Japan. His cartoons were in newspapers across the country, but he actually went beyond patriotism, and he would depict Japanese people as less than human. In fact, if you Google some of the images, they're pretty racist. This was at a time when Japanese Americans, as you know, were rounded up and put in internment camps, really a shameful part of our history, that we've since officially apologized and made reparations for. Sean McDowell: I love that line, and I've used that line many times, when talking about the issue of pro-life, that human value doesn't come from your size or where you're from, but just being a person. You really argue that that's at the heart of human dignity, is understanding what it means to be a person. Can you talk about that a little bit, and also how you ground human dignity within the Christian worldview? Daniel Darling: Yeah, I mean, the Bible has such a rich and exalted view of humanity that I've always been fascinated by. I mean, you think about it. In the opening pages of the Bible, in Genesis, when Moses is writing about the creation of the world, how God created the world, for most of, for all of the natural order, the Bible says, Moses says, God spoke it into existence, but he slows down his narration when he talks about the creation of humans, and he uses this just rich language, where he says that God reached with His hands into the dust of the ground and sculpted humans and breathed into them the breath of life and that humans are stamped with the image of God. King David says in Psalm 139 that every human being is knit together by God, intentionally, in the mother's womb. It's such an exalted view of humanity, that humans ... there's something different about humans, above the rest of creation. We're not God, but we're not animals or angels either, and there's a special care that God has given humans, a special responsibility. Human dignity is grounded in the fact that we were designed by a Creator that ... We're made in His image, which gives us both, as I said, responsibility, but it also gives us a certain dignity. Scott Rae: Dan, there are a couple of responses to this that we hear culturally fairly often. One of those is from people like Peter Singer, the Princeton philosopher, who has actually argued that the view that you just espoused is what he calls a speciesist view. That is, you're actually being a racist for your species, and it unnecessarily and illegitimately elevates human beings over the rest of the animal world. The other response we get, culturally, is from someone like the Harvard psychologist, Steven Pinker, who I'm sure you're familiar with his speech, which he entitled “The Stupidity of Dignity,” where he maintains that the appeal to dignity is just a speciesist concept that is a mask for other things that we're trying to accomplish. How would you respond to both Singer and to Pinker, in the way they push back against this idea of human dignity? Daniel Darling: Well, I would have two responses. I think one, on one level, Peter Singer is carrying out a sort of secularist vision to his very conclusion. I mean, without the Christian theology, there's really not a great basis for human dignity. In fact, a lot of people said this. When the Declaration of Human Rights was drafted after World War II, they brought in all the leading ethicists, philosophers, on it. It's a beautiful declaration. It talks about the dignity of every human being. They agreed that this document needed to be drafted, but they could not agree on a moral basis. A lot of researchers, like Timothy Shah at Georgetown and several others, Oliver O'Donovan, and some other philosophers have said that this idea of human dignity is a theological assertion. There has to be a theological [motive under] it. If you don't have that, you go where Peter Singer is, and you say there actually isn't a difference between the species. On a second level, though, I think there's an instinct sense in all of us that there's something special about humanity. Even the Peter Singers of the world and the Steven Pinkers of the world acknowledge this without saying it. For instance, they're making their case that there's nothing special about humans ... They're making that to humans. Why are they doing that? Why don't they address a vegetable garden, or why don't they address sea mammals with their arguments? They have to address their arguments toward people, because people are the only ones who can rationally think about their arguments and respond. When they go to work, and when they live their lives, they depend on humans as a functioning, ordered society. I think these guys actually do believe that there's something special and dignified about humanity, without acknowledging it. Scott Rae: I wonder if it'd be fair to say that Singer and Pinker and others of a more secular ilk would embrace the idea of human rights, but maybe not the idea of human dignity. Daniel Darling: Yeah, yeah, that's a good question, but the thing is, though, it's hard to get to human rights if you don't have human dignity, because if humans don't have inherent dignity, why should they be privileged and why do they have rights? I mean, that's the thing that I don't quite understand, and in a sense, Singer is, in a sense, be intellectually honest. He's following his [inaudible] to the logical extent. The problem with that idea, if you don't have a sense of human dignity, you don't get to human rights. Then you get to a place in societies, where certain groups of people ... It's justified doing harm to them, because you don't feel that there's any sort of special dignity or protection for them. Scott Rae: Okay, which of course, that's the idea that we ... where we start to resist that idea. Scott Rae: Let me ask you one other question on this, where I think culture pushes back a bit, and that is, I mean, we would certainly agree that the idea of human dignity is, at its core, a theologically grounded idea, and that if there is no Creator God, who has invested human beings with dignity intrinsically and made human beings in His image, then the concept of dignity really does have no basis. I think you're right about that. Let me ... I'll tell you a story about a student of mine that I had a couple of years ago. She did her undergrad work at one of the Cal State state universities, here. She was in a history class with a professor who was lamenting the fact of the Holocaust and made the assertion that if Christianity didn't exist, the Holocaust would never have happened. How would you respond to that in the discussion of dignity? Daniel Darling: Well, there's a couple things to think about. Number one, and I think Tim Keller actually gave a really great talk to, I think it was Parliament, not long ago, a few weeks ago. He made the case, and I actually make the case in the book, too, that at times ... First of all, the thing we have to acknowledge is that German society was a Christian, civilized country, and yet they still allowed the Holocaust to happen. What happens is that, over time, people justify harm to certain groups of people that they have marginalized and dehumanized, but just because we're saying that human dignity has its basis in Christianity and that human dignity is one of the best gifts that Christianity gives to the world, that doesn't necessarily mean that Christians in every context have always lived this out [basically]. I would argue that whenever Christians are complicit in atrocities, it's because they've gotten away from the center of their faith, not because they've gone to the center of their faith. Scott Rae: Yeah, that's a helpful distinction. Daniel Darling: Christianity introduced this concept into the world, and so when there's criticisms, you're actually borrowing from our own ethic to criticize. Scott Rae: Yeah, and I think you can actually make a good argument that a lot of the appeal to human dignity today, culturally, is doing just that. It's living on borrowed capital from the Judeo-Christian roots from 50 to 100 years ago. Daniel Darling: Yeah, we're actually at a place where we're so far along in Western history, in Christendom, if you will, that a lot of people are living in an infrastructure built, in some ways, by Christendom, that they don't recognize the roots of it, and so the criticisms they're making, valid ones, of Christians are borrowing from the ethic that they think they oppose, so I think that's interesting. Scott Rae: Yeah, fair point. Sean McDowell: Dan, you have a section in your book, where you talk about how human dignity relates to the gospel, and you say that it unites two seemingly disparate strands of the Christian life. What do you mean by those two seemingly disparate strands, and how does dignity tie that together in the Gospel? Daniel Darling: You know, there's always ... There's been the age-old question, at least for evangelicals. It seems like every generation, we're having this argument. We had it in the beginning of the 20th century. We had it in the middle of the 20th century. We're having it now. Is the gospel proclamation of individual salvation in Christ by faith, or is it social action on behalf of the vulnerable? We're always acting as if those two things are divided, and I think, when you understand the concept of human dignity, and you understand the concept, the idea, of the kingdom of God, I don't think Jesus lets you do that, right? Jesus comes and He says ... first of all, He says, “Repent, for the Kingdom of Heaven is at hand,” so he's telling people that you need individual, personal repentance and faith in the Messiah, in Christ, to get into the kingdom. He's telling this to Nicodemus, who's the most righteous man of all. Even he needs to do that. He's also saying, “The Kingdom of Heaven is at hand,” and look at what the kingdom is like, so when the disciples of John come to Him and say, “We just want to make sure that You're the right King,” He said, “Look what's happening,” of the lame walking, of the blind having sight. He talks about the kingdom being good news for the poor, so it's both. There's an entrance into the kingdom through salvation in Christ, but now that we're living for another King in another kingdom, as the Church, we're the outpost of the kingdom. We show the world what it looks like. We do that when we come alongside the vulnerable, when we show the world what it means to value every single person, regardless of the utility, regardless of their perceived value in society. I think this idea ... I don't think, if you really understand the gospel, and you really understand this idea, maybe, that you can separate both of these things, of gospel proclamation and social action. Sean McDowell: One of the challenges for recognizing dignity today is that the understanding of dignity has seemingly changed radically, so sociologist Mark Regnerus, wrote an article two, three years ago, called “Dignity 2.0,” in which he argues that dignity has shifted from something human beings inherently have because of the kinds of things they are to affirming somebody in their choices of behavior, based upon their feelings. We hear about death with dignity, or if I don't affirm certain choices you make in your life, I'm robbing you of your dignity. Part of my question for you is how do we live out a Christian view of dignity, in particular with younger generations, when they seem to be operating under an entirely different understanding of what dignity is? Daniel Darling: I'm glad you asked that question, because that's often where it gets confused. I think there's this idea that to recognize someone's full humanity/dignity, I have to solemnize and affirm every choice they make and every decision they are. Well, that's actually not what human dignity is. That's not what it means to be created in the image of God. Our worth is given to us by God, because of our status as image bearers. It's not dependent on our choices. It's not dependent on anything else. In fact, we don't derive our identity from our sexual orientation, from any sort of choices we make. Our identity is not in that. Our identity is that we're an image bearer of Christ. Actually, I think to just automatically affirm someone's choices and behaviors, in some ways, dehumanizes them and patronizes them, because one of the essential parts of being human is that we are accountable to God, that we are accountable to our Creator, and so not acknowledging that and automatically affirming and agreeing with somebody almost treats them as someone that's less than human, and this has to be patronizing. I think mixing up those two things is really a problem, especially when it comes to the collision with religious liberty. All of a sudden now, my dignity is derived. You think of the Masterpiece Cakes case, that the state is essentially saying, “In order to recognize the full humanity of a gay couple, the cake baker has to sacrifice his own dignity and his own conscience to affirm them.” I think that's really not ... I think that's not a good pathway, and I think it's a distortion of what human dignity actually means. Scott Rae: Yeah, Sean, I think part of the issue on the question you raised, and Dan, I think, I like your response to this, is that the premise, I think, of “Dignity 2.0” is that everybody's life choices are on an equal level playing field, morally speaking, and that's just simply not true, but we treat people's life choices, their subjective life choices and preferences, as though they were all on the same level playing field, which I think clearly they are not. Daniel Darling: Yeah, yeah, and to follow up on that, I think ... I have a chapter on sexuality, and I think part of being an image bearer, part of being an image bearer of God is the idea that we are not God. We're not animals, but we're not God. We were not designed to be autonomous creatures. We are designed to live in harmony with our Maker, to live according to the way that we were designed. That's part of what it means to be human. The temptation, since Eden, is always to try to be like God, and to be our own gods and to worship ourselves in self-worship. This is why the Old Testament talks a lot about idolatry. This is why the first commandment is don't make graven images, but that's the first temptation is to forget that we are image bearers of God, and to, then, create our own images with our own hands or to worship ourselves. We're not the masters of our own fates. We're not the sum total ... Our identity is not the sum total of our desires and the sum total of our life choices. Our dignity and our worth is bestowed to us by our Creator. Scott Rae: Dan, I appreciate your emphasis in the book, how you laid a really good theological foundation, but then you spent a lot of time putting shoe leather on it, too, and talking about how your view of intrinsic human dignity as God's good gift impacts several specific issues that the culture is wrestling with. Tell our listeners a bit. How does the view of dignity that you defend make a difference in our discussion about race? Daniel Darling: Well, I think this was probably the hardest chapter I had to write, just because I really, as a white evangelical living in majority culture, it's hard for me to understand what it's like as someone who's lived in the minority culture, but I really talked to a lot of friends, and I just tried to really think through what this means. I think it's essential to talk of ... I think human dignity is essential to the conversation about race, because essentially, what racism is, is a kind of dehumanizing. It's to say that you're less valuable because of the color of your skin or because of your ethnic origin. It's a usurping of God's authority and to put yourself in a god-like position to declare worth, dispense worth based on skin color. Part of what Martin Luther King was doing in his Civil Rights Movement, he appealed a lot to human dignity. He was trying to tell the white supremacists, can you look at me and see me as a whole human being, not just a problem, not just an obstacle, not just something less than human? I think of just a vivid picture of when he was striking with the sanitation workers in Memphis, and they had a sandwich board sign that said, “I am a man.” What they're saying is, “We are not property. We are not garbage. We are whole human beings. Can you see us in all of our humanity?” Part of helping work toward racial unity and racial justice is for us to listen and learn that people are different than us and see them in their full humanity, to listen, to learn, to understand, to not see people as the sum total of their arguments or to see people in categories and groups, but to see them the way that God sees them. Scott Rae: Okay, good. Now let's take the same question, but about immigration. Daniel Darling: Immigration is a complex issue, right? I think good people will disagree on exactly where the line should be, and how government ... how many people government should let in. Governments, having been given the sword by God, have a responsibility to control their borders, have the responsibility to make those decisions. I think one of the things that we have to avoid in the immigration discussion, one of the things that really has bothered me over the years is some of the ways that conservative Christians will talk about immigrants themselves and use dehumanizing terms, things like anchor babies or calling immigrants rats or invaders. These are subtle ways that we use language to dehumanize. When you dehumanize a population, you justify doing just about anything to them. I think another really dangerous place we go in the immigration debate is it's easy to fall into this Darwinian mindset that one group of people's flourishing is an obstacle to another group of people's flourishing. This is an argument the pro-choice people make, that the flourishing of babies is an obstacle to the flourishing of women. Well, I hear a lot of people say that about immigrants, that the flourishing of this immigrant community over here is an obstacle to the flourishing of this working class community over here. I just think that's an unbiblical concept when we start pitting groups against each other. Scott Rae: Okay, one or two more ... Same question on how intrinsic human dignity impacts the discussion of health care. Daniel Darling: Well, this is an important topic, and I think, again, this is an area where good Christians disagree on health care delivery, but I do think what we should agree on, what we have to agree on, have to say, is that if you believe that every single person has dignity and worth, then we should care about someone's access to health care. We should care that they have access to proper care when they get sick. We can't have a mindset that is dismissive of, oh, as if we don't care about what happens to people. Part of having dignity is having access to care giving, to get healthy and be [inaudible], and so it's a difficult issues, and I think good people are going to disagree on exactly how health care should be delivered. Should it be market-driven? Should it be government-driven? I think there's errors on both sides. I think some people who really believe in the power of the state don't understand how sometimes the state can rob people of dignity and can be soulless and can actually hurt health care in many ways. I also think that some people, like me, who tend to believe more in the power of markets are sometimes blind to the way that sometimes markets can do the same thing and have a cutthroat mentality of, well, let the market decide. Well, sometimes the market decides that that person who has cancer is not worth the risk. We're just going to let them die. I think, as Christians, we should care deeply about health care. We should, because I do think it's a human dignity issue. I do think it's a pro-life issue, that we should not be callous to it. Obviously, we'll come to different conclusions, probably, on exactly how to ... what's the most prudent way forward. Scott Rae: Okay, one more, then, briefly on how intrinsic human dignity affects our discussion of technology. Daniel Darling: Well, I think it's really important. I think it's one of the biggest discussions that's going on right now is what exactly does it mean to be human? I think we're having these discussions. I mean, on one level, technology is a fulfillment of the creation mandate. The act of technology is to fulfill the mandate to create and explore, to innovate. As we create, because we are created by a Creator, well, we image God when we create things, when we take the raw materials that He's given us, and we use them to create things. On the other hand, technology can be corrupted in a fallen world, right? It can be used for bad ends. I think we always have to be asking, not just, “What are we doing with technology?”, but I also think we need to ask ourselves, “What is technology doing to us? What are ways that it's taking away our humanity? What are ways that it's replacing ...” I think there's a big discussion right now about artificial intelligence. How is this displacing work? What is this doing to us, as for our humanity? I think, on a practical level, even the way we communicate ... I love social media, and I think it's really, in many ways, helped people communicate better. It's lifted voices that have been marginalized before, but it also can be toxic. There's a way in which technology removes the face-to-face communication that we were built for. It removes the sense of community that we were built for. I read a fantastic book by Jean Twenge, called iGen, that really explored the ways that constant screen time by Generation Z, if you will, or iGen, has really stunted social skills. We were built for community, built for face-to-face interaction. I think the Church really needs to address this. One of the things that I think is so interesting to me is that the very rhythms of worship may actually be the respite that a digitally exhausted world needs. Think about this. For a lot of people, they're coming in on Sundays, having just ... being exhausted digitally, and you're coming into embodied worship, and you're sitting physically with other brothers and sisters. You're taking the cup, taking the bread, physically. You're praying together. It's very embodied, very analog. Those sort of rhythms, I think, are going to be increasingly more important and good for our souls. Sean McDowell: Dan, this is really, really good stuff. I love how you're tying the central concept of humans being made in God's image and having dignity to a range of different ethical issues. We've kind of just scratched the surface here, where you have chapters. You go into race, abortion, immigration, health care, technology, sexual issues, and so on, trying to help Christians see that, at the heart of how we approach all these ethical issues, is treating people with dignity. Thanks for your writing. Thanks for your posture. Thanks for coming on the show. Daniel Darling: Man, thank you guys, great discussion. I really appreciate the work you all are doing there, some really important work helping people think and how to live on mission for God in this 21st century. Sean McDowell: Well, thanks for your work. 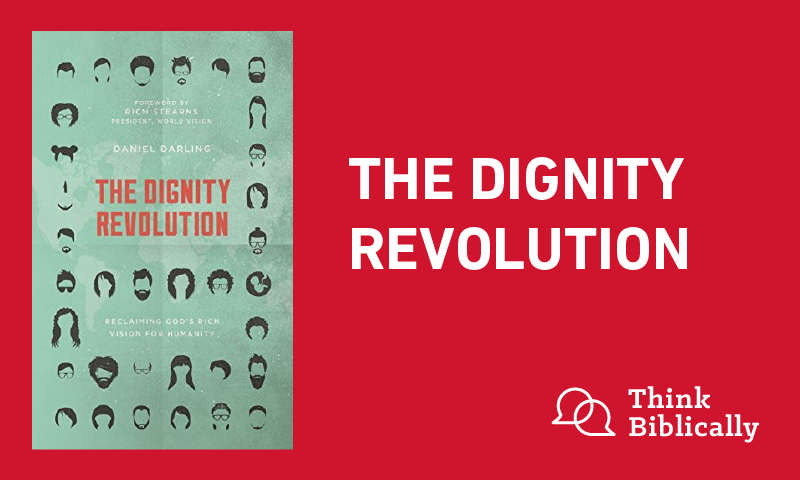 We want to encourage our listeners to pick up a copy of your book, The Dignity Revolution. Thanks again for coming on. Scott Rae: Yeah, thanks Dan. Sean McDowell: This has been an episode of the podcast, “Think Biblically: Conversations on Faith and Culture.” To learn more about us and today's guest, Daniel Darling, and to find more episodes, go to biola.edu/thinkbiblically. That's biola.edu/thinkbiblically. If you enjoyed today's conversation, give us a rating on your podcast app and share it with a friend. Thanks for listening, and remember, think biblically about everything.